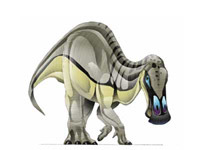 The “Edmonton Lizard” is a well known duck-billed dinosaur from the Late Cretaceous period. The original specimen was discovered in 1882 in the Hell Creek Formation by Dr. J. L. Wortman and R. S. Hill for Edward Drinker Cope. Described under several different names, including “Diclonius mirabilis” by Cope personally, “Claosaurus annectens” by Othniel C. Marsh in 1892, a later attempt at resolving the confusion created by the results of so many different classifications led Richard S. Lull to coin “Anatosaurus copei” in 1942 (later the name Anatotitan appeared in several publications in the 1970’s to 90’s). This was the name that the specimens stayed under until 2011 when ontogenetic studies finally proved that Anatotitan was the mature form of Edmontosaurus annectens. Edmontosaurus was roughly 12m (39.4ft) long, 3.7 meters (12ft) high and weighed 3.3 tons. It lived in the Late Cretaceous, during the Maastrichtian, roughly 67-66mya. Another species is presently known in the genus Edmontosaurus, E. regalis. Due to the extreme similarity between Edmontosaurus and Anatotitan, today Anatotitan is considered to be Edmontosaurus. Brett-Surman’s(1979) analysis of the two animal’s skulls are not reliable because Anatotitan’s skull was crushed and distorted. 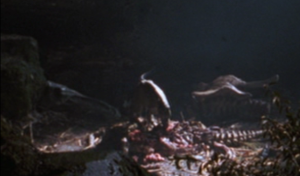 This animal is heavily debated to be on Isla Sorna due to a supposed skull found in the T. rex Nest in 1997; however, there is no other film evidence to support this claim and it’s based on visual identification at this point only. The skull was compared to other known hadrosaurs to see if it was either a Maiasaura or Hadrosaurus. The Maiasaura skull is too short and Hadrosaurus does not have skull known to science. It was then concluded that the only skull to match up was obviously Edmontosaurus. It is revealed that by the time of 2015, Edmontosaurus was cloned by InGen and in place on the theme park built by Masrani on Isla Nublar for the Jurassic World theme park.